Money is scarce in the beginning of Tree of Tranquility, and items are way overpriced. You'll have to spend days grinding away at the riverbed and in the garden just to be able to earn enough dough to buy a single frying pan or other useful item. It's a constant struggle, until you've managed to build your farm up enough and get into a good rhythm. Despite your best efforts, you'll soon find practically everything about Tree of Tranquility moves at a snail's pace. 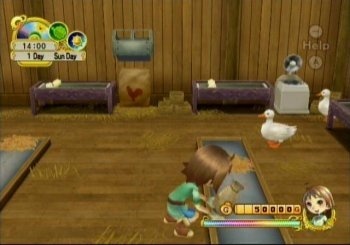 As with past Harvest Moon games, progression largely depends on what you aim to accomplish. Though days pass and seasons change, you can pour many hours into your farmstead without making much actual headway in the game. Sadly, even when you're making a concerted effort over a long period of time to move things along, it still seems achievement of the game's major goals takes forever. Even with some substantial visual changes and a different land to explore, the underlying gameplay is still very much the same as it has been for quite some time. Growing seasonal crops for shipping is still an engrossing process. You till the soil, sow the seeds, water them daily, watch them grow and harvest them at the appropriate time. Tree of Tranquility lets you plant crops in long rows, which is a nice change from the 6x6 squares of past games. Without an aiming box, you'll find yourself watering the wrong plants from time to time, but it's less of an issue than it has been in the past. Tacked on (and thankfully optional) motion controls involve the same single rote maneuver, regardless of what task you're performing or what tool you're using. It's a little too easy to trigger the actions inadvertently, accidentally chopping at a poor animal or mowing down an important crop in the process. Other endeavors like mining, raising and caring for animals, courting a mate (you can play as either a male or female character from the start), making friends with villagers and expanding your home are all too familiar. There are some fresh nuances incorporated into some of these activities, but they're so minor I hesitate to spoil the few meager surprises in store for players. Tree of Tranquility has its high points, but it's far from the strongest entry in the series. Many of the game's shortcomings can easily be overlooked by players who are giving the franchise a try for the first time. However, those who've faithfully stuck with the farming sim over the years will find this latest entry offers more of the same. There's simply not enough new material here to warrant a new game. Bottom line: There's too much recycling and not enough substantial improvements. The series' staples are here and enjoyable, yet innovation is missing. Recommendation: Tree of Tranquility is worth buying if you have the time to leisurely wade through all it has to offer. Still, don't be surprised if you find yourself tempted to toss it on top of the trade-in pile. Nathan Meunier is considering taking up goat whispering.